The history of Finnish music is unexpectedly rich in women who have written music. Nearly three dozen interesting personalities may be found in the 19th and early 20th centuries alone. The present series of articles discusses the lives and music of these women – an excellent opportunity for the reader to learn more about this largely unexplored group of Finnish classical composers. This first article serves as an introduction and also showcases a concert series given by violinist Mirka Malmi to give voice to this forgotten music. Fanny Mannsén (1834–1856) was a composer and pianist born in Turku. She was a rare prodigy in the history of Finnish music. At the age of twelve, chaperoned by her mother Karolina Mannsén, also a pianist, she went to study in St Petersburg; and it was there that she succumbed to an epidemic, only 21 years old. During her brief career, she gave recitals, wrote music and established a reputation as a virtuoso – becoming a 19th-century teen celebrity. In St Petersburg, Fanny Mannsén studied with the best of the best. Her longest-standing teacher was legendary pianist and composer Adolf von Henselt. She also studied the piano with Anton Gerke and probably studied composition with Henri Vieuxtemps. We know that at least two pieces for piano by Mannsén were published in St Petersburg: L’adieu (Souvenir à l’Åbo, Fantaisie mélancolique) and Chanson de Berceau (1852). However, despite delving into archives, this far we have been unable to unearth the scores of these works written by a budding composer at age 17. Mannsén’s life and her lost compositions are just one example of the intriguing stories we have unearthed in studying Finnish women composers born in the 19th century. Our venture into this largely unexplored realm has been coloured by surprises, clues and hidden treasures, although these are more than balanced by laborious archive searches, the realisation that many documents have disappeared forever, and the resulting randomness and guesswork. Our book project, Sävelten tyttäret: Säveltävät naiset Suomen historiassa 1700-luvun lopulta 1900-luvun alkuun [Daughters of music: Finnish Women Composers, from the late 18th to the early 20th centuries], is in its infancy. Yet we have found out enough to recognise a pattern that emerges with considerable regularity in the lives of these composers: studying abroad, leading a cosmopolitan life (partly or wholly outside Finland), participating in progressive social movements (women’s rights, education policy, charity) and combining composing with performing and/or teaching. Many of these composers actually had their music published in their lifetime and created a successful career in music, but subsequently the history of music has nearly completely ignored them. The lives of composing women were governed by the gender discrimination that was the norm at the time, but on the other hand they were characterised by a breaking of boundaries, a strength of will, the establishing of an alternative culture and the collaboration of women musicians across borders. Many were quite radical in deviating from the gender norms of the day: the history of Finnish women composers overlaps to a great extent with the history of sexual and gender minorities in Finland. Yet perhaps the greatest surprise of all was discovering just how many women there have been who tried their hand at writing music (see a list in the article introducing this series). We should remember, though, that the majority of students at the Helsinki Music Institute (subsequently the Helsinki Conservatory and then the Sibelius Academy), from its founding in 1882 well into the 1950s, were women. Indeed, the very first star pupil of that institution in both composition and the violin was a woman, Agnes Tschetschulin (1859–1942), who went on to create a career abroad. Despite the deck being stacked against them in society, so to speak, women have for a long time been major players in Finnish music – but ignored. So there is a need to tell stories about Finnish music that deviate from the established narrative. The pioneering book Musiikin toinen sukupuoli [The other gender in music] (1992) by Riitta Valkeila and Pirkko Moisala presents eight Finnish women composers from around the turn of the 20th century, but it is not based on original archival sources. 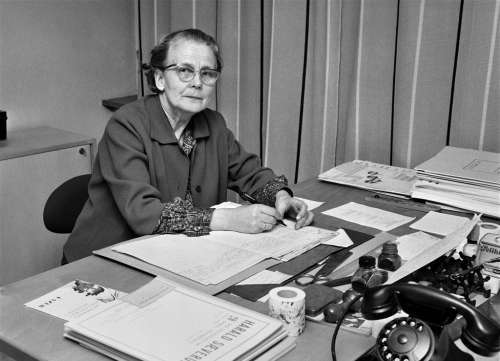 Some monographs and theses have been written on individual composers; an example is Eila Tarasti’s biographical study of Helvi Leiviskä (1902–1982), entitled Nouse, ole kirkas: Helvi Leiviskän elämä ja teokset [Arise, be bright: The life and works of Helvi Leiviskä] (2017). Although digging out the music left by these women is drudgery at times, what we have found seems exceptionally compelling, fresh and exciting. Looking at long-lost compositions, one feels a direct connection to the strong-willed women who went ahead and wrote music in an era when such pursuits were not considered suitable or permissible for women. Their music is their voice, and it carries to our day if we only lend our ears to it. The music of Helvi Leiviskä is characterised by extensive forms and a theosophical wrangling with the fundamental questions of life. Her music often sounds seeking or exploratory. Violinist Mirka Malmi (b. 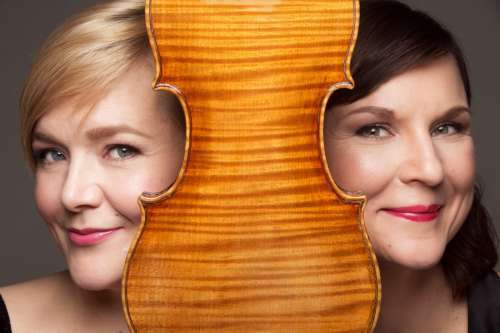 1977) is organising a series of seven concerts in the Helsinki area in 2018–2019, featuring chamber music by Nordic women composers for violin and other instruments written between 1850 and 1950. In March 2017, Malmi gave a concert with the title Pohjoismaisia naisia [Nordic women] in the chamber music series of the Finnish Radio Symphony Orchestra. “The concert was so well received that I dared to plan a whole series of seven concerts on the same topic.” The next concert, scheduled for 10 February, is titled Suomalainen nainen [The Finnish woman], and it features chamber music by Helvi Leiviskä. (Watch the concert video on FMQ's YouTube channel.) In August, the Romanssi [Romance] concert will include music for violin and piano by Tschetschulin, Ida Moberg (1859–1947) and Laura Netzel (1830–1927). “Chamber music was the vehicle with which women musicians could get their voices heard back in the day,” explains Malmi. Women musicians and women composers’ works were generally not considered suitable for symphony orchestras. The tendency to exclude women from public music-making continued well into the 20th century. Laws and rules against women’s participation in musical pursuits were not the only obstacles; a belittling attitude and marginalisation were quite as effective. Yet despite all this, some women managed to write a considerable body of music, up to and including orchestral music and music for the stage, such as Moberg, Leiviskä and Betzy Holmberg (1860–1900), whom the press hailed as a genius. Others focused on writing pedagogical materials, instrument primers, songs for communal singing and children’s music. Examples of such composers are Henriette Nyberg (1830–1911), a pioneer in Finnish music education, and Lilli Thuneberg (1836–1922) and Sofie Lithenius (1846–1926), some of whose songs are still sung in Finnish schools to this day. Still others were virtuoso instrumentalist-composers as was typical in the 19th century, such as the aforementioned Mannsén and Tschetschulin. Some were both composers and authors, such as Edith Sohlström (1870–1934), known for her popular Elegia for cello and piano, and Lullu Woldstedt-Buch (1883–1965). Betzy Holmberg studied in Copenhagen and Leipzig. She lived in Norway for most of her life and was, according to Finland’s Official Journal, a “musical genius”. 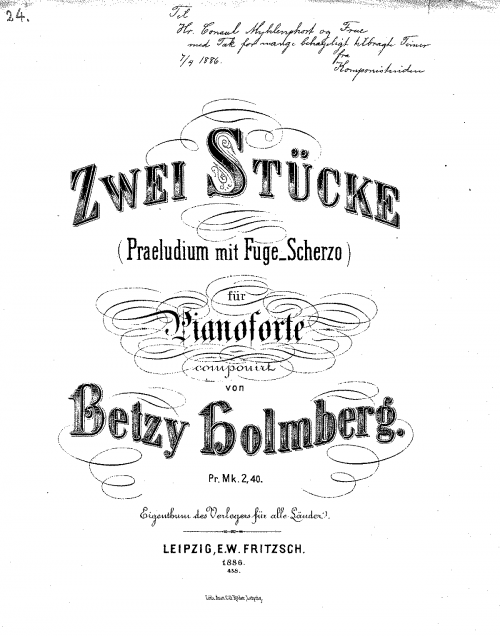 Her works include a Symphony (1884). The Preludi ja fuuga pictured here is one of her most frequently performed piano works. Or, to put it another way: since women composers were not accepted into official musical circles, they felt no obligation to write ‘Finnish’ music to uphold national institutions. Also, Finland did not have networks of women musicians as was the case in major European cities where women went about creating their own music and ignoring the male musical establishment. Accordingly, many Finnish women composers travelled abroad and stayed there for extensive periods of time, in some cases permanently – in Berlin, Dresden, Leipzig, London or St Petersburg. “Many of these women were well-known composer-musicians in their day, but their output has since been forgotten or marginalised. Perhaps there was no one to keep the works in circulation once the composer was no longer around,” Malmi ponders. “Audience feedback on this concert series has been very enthusiastic. Many have wondered why they have never heard of these composers or their music.” The reception from listeners and colleagues encourages Malmi to carry on. “It will be exciting to see where this leads. My repertoire as a violinist has changed profoundly,” says Malmi with amusement. We talk about how the music of women composers could be promoted beyond performances – with recordings and printed music. Festivals participating in the international Keychange project undertake by 2022 to book the same number of men and women as performers (for political reasons, trans and other genders are counted with the women). In Finland, Music Finland coordinated and published a set of theses to promote gender equality, diversity and non-discrimination in the music business in 2018. These theses have since been signed by more than 100 organisations and companies, including the Association of Finnish Symphony Orchestras and the Society of Finnish Composers. Compositions by women should be a natural component of today’s concert culture, music teaching and musical life in general. Exploring the lives of historical women composers is particularly eye-opening and thought-provoking because of their disadvantaged social status. Rehabilitating the works of women composers alters the canon of Finnish classical music, revitalises concert programming and brings an added zest to music teaching. It changes how we think about ourselves, our past and our future. It offers a wider range of artists to identify with, builds community and contributes to achieving a more gender-equal world. Mirka Malmi was interviewed by Susanna Välimäki. Featured photo: Violinist Mirka Malmi constantly searches archives and libraries to find new repertoire by women composers. Her concert on 10 February 2019 features chamber music by Helvi Leiviskä. Photo by Susannan Välimäki. A celebration of historical Finnish women who wrote music, the series of articles for FMQ by Susanna Välimäki and Nuppu Koivisto, is derived from their book project titled Sävelten tyttäret: Säveltävät naiset Suomen historiassa 1700-luvun lopulta 1900-luvun alkuun [Daughters of music: Finnish women composers, from the end of the 18th to the early 20th centuries]. Violinist Mirka Malmi works regularly with pianist Tiina Karakorpi, another activist musician promoting women’s music. Photo: Ville Paul Paasimaa. Watch the concert video on FMQ's YouTube channel.